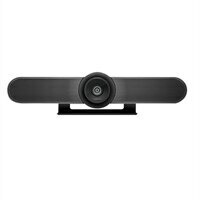 MeetUp is Logitech's premier ConferenceCam designed for small conference rooms and huddle rooms. With a room capturing, super-wide 120° field of view, MeetUp makes every seat at the table clearly visible. Motorized pan/tilt widens FOV even further: up to 170°. A low-distortion Logitech-engineered lens, Ultra HD 4K optics, and three camera presets deliver remarkable video quality and further enhance face-to-face collaboration. MeetUp's integrated audio is optimized for huddle room acoustics and delivers an exceptional sound experience. Three horizontally-aimed beamforming mics and a custom-tuned speaker help ensure your meetings sound as great as they look. MeetUp's front-of-room audio provides an intuitive and coherent listening experience. With a compact all-in-one design that minimizes cable clutter, MeetUp is USB plug-and-play and simply works right out of the box with any video conferencing software application and cloud service - including the ones you already use.